Every year on the second Friday & Saturday of August (Aug 12 & 13), the Port Oneida Rural Historic District comes alive with activity for the annual Port Oneida Fair (also see the NPS page on the fair). 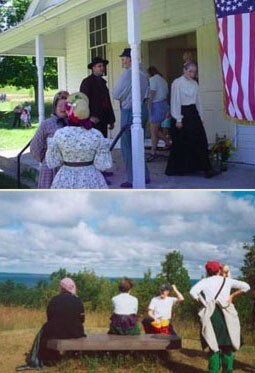 Visitors have the chance to step back in time to experience life as it was in the late 1800s and early 1900s. Visitors can take the trolley, drive, hike, or bike to the six unique historic sites where a variety of traditional rural crafts and activities take place. Timber framers, antique boat builders and quilt makers will be demonstrating their craft. Potters and blacksmiths will be hard at work. Children can try their hand at crosscut sawing and other farm implements. Oxen can be seen cutting hay in the fields while artists in the fields create paintings inspired by the cultural landscape. Take in a display of antique bicycles, cameras and phonographs. Learn about basket weaving, soapmaking, buttermaking, candle dipping, spinning, and fur trapping. Satisfy your curiosity and walk through many of the historic farmhouses and barns that will be open for tours. The event is hosted by Sleeping Bear Dunes National Lakeshore and co-sponsored by Friends of Sleeping Bear Dunes and Preserve Historic Sleeping Bear. For more information, call the Park at 326-5135. New this year is a Friday evening Chicken Dinner with music from 5-7 PM to benefit Preserve Historic Sleeping Bear. Tickets are $12 online in advance! Speaking of Port Oneida, the Park Service is seeking comment on the Port Oneida Rural Historic District Landscape Management Plan / Environmental Assessment. The National Lakeshore would like your opinion on the best way to manage the historic landscape at Port Oneida and are seeking your comments on the EA until the public comment period closes on September 12, 2011. A public open house on the project is scheduled for Tuesday, August 23, from 5:00 p.m. to 7:00 p.m. at the Philip A. Hart Visitor Center auditorium in Empire. A 30-minute presentation on the EA will be held at 5:30 p.m., with a question and answer period following. Click to review the plan at the Sleeping Bear Dunes National Lakeshore website.